The Pianology Workshop is a piano tuner's workshop. Balancing time between a busy tuning schedule and restoring pianos, means that clearly, the workshop is not about selling lots of pianos as quickly as possible but rather about selling to pianists who care about the quality of their pianos. The pianos offered for sale at the Pianology Workshop will have undergone careful scrutiny and repair. 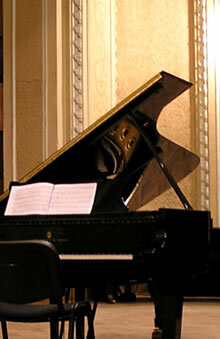 Meticulous attention to detail during the very time-consuming regulation process, gives each 'Pianology-Workshop' piano its own unique feel, voice and tone. The object is to supply pianos that will inspire and to give pianists many years of melodious and trouble-free music-making. Pianology is in tune with the aspirations of all who love playing the piano. Contact Pianology for details of stock. Whether a keen young student, a serious amateur or a professional pianist, you want your piano to play a full and positive part in all your music-making endeavours - free of hassle and grief. The odd misfiring note…the jangle of strings no longer in tune… the squeaky pedal…etc…etc…etc. These problems and many more besides, detract from the simple business of playing the piano. There is nothing quite like playing a piano that is in good working order! The Pianology Workshop can advise you on the best value-for-money solutions to rediscover the joys of playing your piano! Contact Pianology for further details.